When the Swiss ace Roger Federer strode into Wimbledon in search of yet another Grand Slam notch on his racket, his adoring fans spotted a small change to his shirt. Gone was the familiar Nike logo to be replaced by the less well-known Japanese brand Uniqlo. It later emerged that Federer had agreed a deal to be paid $300m (€263m) over 10 years to act as Uniqlo’s brand ambassador. When a sponsorship coup as large as that is possible for a 36 year-old athlete, it underlines the financial strength of modern sports people and the excesses they can encourage in sportswear producers. Uniqlo is a creature of the 21st century. But Europe has pioneered the business of making big bucks out of the bizarre idea that if a fan wears the same shirt as Federer, he or she might be able to replicate the same backhand volleys. One of these European brand specialists is our target company this week, the German-based Puma. 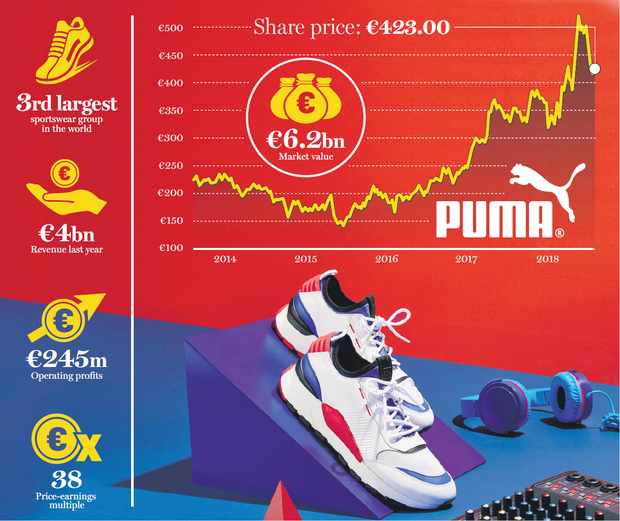 What makes Puma interesting at this moment is that early this year the French luxury group Kering decided to reduce its 86pc shareholding to 16pc. Kering bought into Puma more than a decade ago with an ambition to develop both a luxury and sportswear business. It has since decided to focus only on luxury goods and its sportswear ambitions were pushed into row Z. We wondered if this opens an investment opportunity. Puma has never been all that far from a good row. It arose out of a family feud between two German Dassler brothers who worked together as shoemakers for 20 years. The split created both Adidas and Puma. However, the feud did not prevent the two companies, and their American rival Nike, changing the face of sport and in turn creating a massive money spinner. Puma is managed by Bjorn Gulden, a former Norwegian international footballer. The group floated on the Frankfurt Stock Exchange more than 30 years ago and today is the third largest sportswear group in the world. It designs and sells footwear, apparel and accessories. The secret in this game is to line up ‘stars’ to sponsor the gear and act as ambassadors for the brand. Puma has, over the years, signed up ‘greats’ like Diego Maradona, Pele, Usain Bolt and clubs like Arsenal, Borussia Dortmund and AC Milan. It markets its goods in more than 120 countries and while the company has a global footprint, it is still HQ’d in the sleepy Bavarian town of Herzogenaurach, where it all started. Group sales last year were a record at €4bn, with footwear accounting for half of total sales, apparel slightly over one-third and accessories making up the remainder. Its global sales are concentrated on Europe and the US, with three-quarters of total sales. The Asian market, driven by China, accounts for the other quarter. In spite of volatile currency developments, political instability and uncertain trade environment, Puma is in the middle of a revival after years of indifferent performance. Last year the group, valued at €6.2bn, had healthy growth with revenues of €4bn. Operating profits of €245m were double that of the previous year and expected to rise this year. The shares climbed from a yearly low of €277 per share and now trade at €411, having fallen from a high of €539. The current price earnings multiple is a massive 38, earnings per share are 11 and free cash flow is expected to exceed that of last year. First-quarter results continued the revival with sales up 7pc and operating profits climbing higher. Like for many others, Donald Trump is causing headaches for Puma. The group has had to consider moving its Chinese production to other Asian countries should the US-China trade spat get worse. Puma currently produces one-third of its products in China, one-third in Vietnam, and the rest among other Asian countries. The US is an essential market for Puma, but moving production to the US is not an option as there is limited shoe capacity in that market. While there is little to fault the company and trading is going to script, I would hold off investing in Puma at this time. Nothing in this section should be taken as a recommendation either explicit or implicit to buy any of the shares mentioned.